The Belgian national football team. Flickr/Eric Drost. Some rights reserved. "Pour tous les Belges qui ont suivis ce match, il y avait moyen de faire quelque chose, fait chier!" The comments by Daniel Van Buyten, Belgium’s number 15, sum up the country’s feelings pretty well after suffering a 1-0 defeat against Argentina on Saturday in the World Cup quarter-finals. But there is nonetheless a real sense that the Red Devils have achieved something that will reverberate far beyond Brasilia’s Estádio Nacional. The national team has exceeded expectations and sky rocketed through the international rankings into the top ten teams from an all-time low of sixty-sixth in 2009. Not only has this restored Belgian's flagging footballing credentials, but with such a young team the experience gained over the last five games will put them in an excellent position ahead of Euro 2016. More importantly though, Belgians have rallied around their team in colourful and often very loud displays of national unity, something that seems to have been lacking over the last years. In a county polarised between a French speaking south and a Flemish speaking north Belgium's World Cup success has gone a long way toward healing Belgium’s linguistic divisions. In the most obvious sign of national unity, Belgian flags have in many places replaced the flags on Flanders and Wallonia – two of Belgium’s three regions. This was even the case in Antwerp, a bastion of Flemish nationalism. On a personal level, football has transcended linguistic divisions and brought Flemish and French speakers together around a common cause. Belgian politicians were quick to join the football frenzy, but with Flemish and Francophone political parties once again deadlocked over the formation of a federal government it remains to be seen whether Belgium's success on the field will have any real impact on the country's contentious political scene. But a resurgent Belgian identity will challenge the separatist agenda espoused by the Flemish N-VA's which has been pushing for Flemish autonomy. Given the N-VA’s victory in regional elections in May and the important role it will likely play in a forthcoming federal government Belgium’s football success has come at a critical juncture. The N-VA's leader Bart de Wever is all too aware of this, and party officials have been doing their best to downplay Belgium World Cup success. Incredibly, authorities in Antwerp – which is controlled by the N-VA – even sought to counter the spread of Belgian flags on the pretext that many of those displayed the “Jupiler” logo, a Wallonian beer. In the end though, the federal police refused to carry out the order. Ultimately it would be too much to hope that the Red Devils alone can turn back the rising tide of Flemish nationalism, let alone solve Belgium's regional issues which include deep socio-economic disparities between North and South. 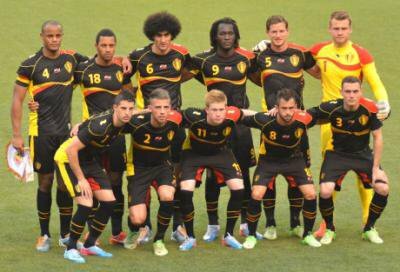 But at the very least Marc Wilmots and his players have reminded Belgians what it feels like to be a united nation. One can only hope that the chant of "tous ensemble!" adopted by football supporters will become a slogan for Belgium's political class.